If you’re in the market for an affordable autopilot packed with performance, the SP-110 has it all. A 4.3” splash proof control head that offers a transflective LCD display and easy to use four button operation, provides you with the information you need to navigate by right at your fingertips. In addition to being easy to use, the SP-110 looks great mounted on any helm, console, or dash. Automatic waypoint steering is now easier than ever when interfaced with a GPS/Chartplotter via NMEA 0183 input/output. The SP-110 is the ideal option for anyone with small to medium sized powerboats. Si-Tex combined rugged reliability, advanced steering features, and simplicity to make the SP-110 one of a kind. 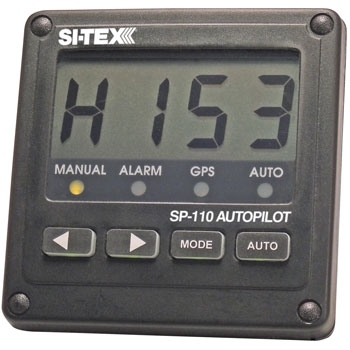 The intuitive design of the Si-Tex SP-110 makes programming and viewing data simply a breeze. Virtual Rudder Feedback capabilities within the SP-110 eliminate the need for a separate rudder feedback unit. If you have a hydraulically steered boat, the SP-110 will pilot the vessel using the included reversing pump. The Si-Tex SP-110 is the ultimate choice for a high performance auto pilot and comes complete with the control unit, standard rate compass, pump and all of the parts you need for a flush or bracket installation. Each Sitex SP110 comes with: Control Unit, Standard Rate Compass, Hardware For Flush Mount, 9ci Reversible Pump, Manuals. and a Two-Year Warranty. Ideal For Small To Medium Sized Powerboats. 4.3” Splash Proof Control Head. Interface To A GPS/Chartplotter Via NMEA 0183 Input/Output For Easy, Automatic Waypoint Steering. Included Pump for Hydraulically Steered Boats with Cubic Inch Capacity of under 9ci. Transflective LCD Display Shows Course & Function Data.